Fitz Henry Lane Online Lessons are designed to encourage students to make observations while looking closely at artwork and archival documents, to carry out their own investigations into the nineteenth-century world of an artist and his surroundings, and to foster critical thinking at multiple levels. Lessons were designed with a 30-45 minute timeframe in mind for observation and group discussion. Assessments were designed for completion with the teacher during additional class time or independently at home. How can a painting shed light on the role played by a maritime community in the industrial growth of America? Fitz Henry Lane lived at a time of growing prosperity for Gloucester and greater Cape Ann. Industries like haying and lumbering were common occupations up and down the coast, but not all communities had access to the dangerous yet lucrative fishing and granite industries. 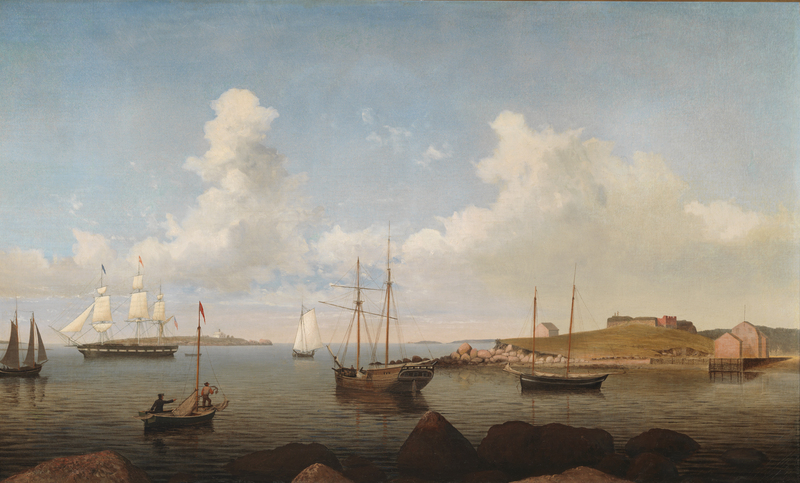 This lesson explores the various Cape Ann industries as depicted in Fitz Henry Lane’s artwork, and the importance these industries played in the growth of the American economy. Students will work together to analyze Gloucester’s industrial activities by taking a close look at paintings and supporting resources. Students will identify the various industries that make up nineteenth-century Gloucester’s economy as they complete a chart. Students will conduct a short research project defining the role Gloucester played in the industrial growth of America. Please note: it is recommended that the teacher preview the site including the paintings, interactive features and historical materials for the lesson in advance. Begin by posing the essential questions: What examples of natural resources can be seen in paintings that tell us what goods and services local businesses and industries provided for the citizens of Gloucester? How did Gloucester contribute to the industrial growth of America in the nineteenth century? What evidence can we find to support our answer? Explain to students that they will be thinking about these questions as they look at paintings created by Fitz Henry Lane in the nineteenth century. When done, they will be asked to work independently to write a short research paper which explains the role Gloucester played in the industrial growth of America. Post the teacher-made wall chart of Worksheet 1 with the headings: I see… I think… I wonder… I know… Hand out Worksheet 1 to all of the students. Have students look closely at the image. Ask them what they see? Ask them to look closely and to begin filling in their observation charts. The painting is the gateway to learning more about the role Gloucester played in the industrial growth of America. Students should read the commentary. As a class, read through the visual guide out loud while referring to the painting projected in the front of the room or on their devices. Show them how to navigate their way around the painting and how to access the interactive feature as well as historical materials. Using the bar at the top of the page, pull down the Historical Materials menu. Click on the Maritime & Other Industries & Facilities tab. Students should spend time clicking on various tabs to learn more about maritime and other industries in Gloucester. On a separate sheet of paper or on their devices, students should take notes and document the sources that they think will be helpful in defining the role Gloucester played in the industrial growth of America. Students will write a short research paper analyzing the role Gloucester played in the industrial growth of America, using primary and secondary sources to support their claims. Students can use their findings as a foundation to determine the role Gloucester plays in America’s economy today. USI. 27 Explain the importance of the Transportation Revolution of the 19th century (the building of canals, roads, bridges, turnpikes, steamboats, and railroads), including the stimulus it provided for the growth of a market economy. USI.28 Explain the emergence and impact of the textile industry in New England and the industrial growth generally throughout Antebellum America. Conduct short as well as more substantial research projects to answer a question (including a self-generated question) or solve a problem; narrow or broaden the inquiry when appropriate; synthesize multiple sources on the subject, demonstrating understanding of the subject under investigation. Citation: "Farms and Fish: A Closer Look at Cape Ann's Industries." Fitz Henry Lane Online. Cape Ann Museum. http://fitzhenrylaneonline.org/resources/for_teachers.php?name=Lesson%20plan%202C:%20Grades%209-12 (accessed April 22, 2019).